This topic is for anyone whether you are attending the meeting or not. Everyone is welcome to contribute their thoughts, it can be about the weather, the food, or people you have met, or just wishing everyone a good trip. Anything goes. If anyone has photos they would like posted please click on the link to the right and send them to me via email ( you will need to login to send email ). Best wishes to everyone traveling and looking forward to hearing about your experience. NOTE: Make sure you allow enough time to get to the DBS and Prism sessions – we want to get started promptly at time indicated. CRIBBAGE AND CARDS: In breakfast area at 2:00 pm each day if people wish. I`m Sorry not to be part of the Omaha gathering ...and like many others, Im sure , will be watching this thread with much interest . The schedule for the week is very full but if anyone would like to experience more of Omaha, below is a link to local events during the week. Good questions! and if anyone else has questions please post them here, and hopefully people attending the meeting can discuss them and get some answers. The funds for this Omaha research are due to the dedication and kindness of the UNMC and I believe that many of the people involved have donated their time as well. And to create a future for OT research they have setup the new UNMC fund. The NORD OT grant that was established a couple years ago is not part of this research. The first grant went to Sabine Meunier, MD, PhD, Movement Disorders Clinic, Pitié-Salpêtrié Hospital Paris, France. The second grant is currently in the vetting process and will be awarded early next year. Because of the potentially limited audience that might be interested in donating to a rare disease such as Orthostatic Tremor it was important for the group to find ways to donate specifically towards research. This is very important.. for increased efficiency, all donations go directly to the UNMC or NORD fund, as a result the donations are never reduced by any OT group costs; meetings, website etc. And in the case of the research, all participants have also contributed their travel costs as well. This is truly a group effort. Great Bronze DiDi love it, to all attending the conference have a wonderful & productive meeting & especially a lot of fun!!! A question I would like to have discussed if I were there would be how do people deal with the emotional aspect of this complicated disease? The anxiety, panic, stress, fear, depression, perception of others, & on & on... You all understand, I sometime find it worst than the actual physical part. Look forward to reading all the threads & pictures. Location: Edmonton, Alberta, Canada & Palm Springs, Ca. It’s a debilitating disorder that causes people to feel like they are going to fall down when they are standing. 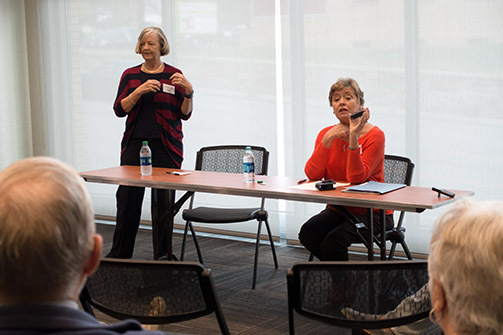 It’s called primary orthostatic tremor (OT), and this week the University of Nebraska Medical Center is hosting more than 50 OT patients from around the world in what is the largest study ever done with OT patients. Dr. Torres-Russotto, who is an associate professor in neurological sciences, said patients will be coming from Spain, England, Canada, Australia and the United States. 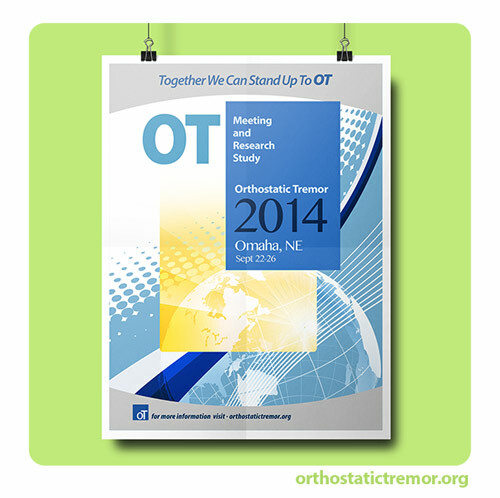 The International Orthostatic Tremor Meeting started Monday evening and will run through Friday. This marks the second time Omaha has hosted the event, with the previous Omaha meeting held in 2012. Last year, the meeting was held in Australia. The patients will each undergo a two-hour physical examination by a movement disorder specialist and a physical therapist, as well as electrophysiological studies. The goal of the study will be to determine if the patients really do have postural instability and to assess the presence of ataxia, a neurological sign consisting of lack of voluntary coordination of muscle movements. In addition to Dr. Torres-Russotto, the research team in neurological sciences includes: John Bertoni, M.D., Ph.D., professor, and Amy Hellman, M.D. and Danish Bhatti, M.D., both assistant professors. Collaborators from UNMC’s hospital partner, The Nebraska Medical Center, include: Jen McKune, Lori Schmaderer and Katie Blacketer -- Physical Therapy Department; and Cindy Penke, Regan Iske and Bobbi Roeder – case managers in the Movement Disorders Department. They will undergo an electroencephalogram (EEG) test, which records brain waves in an effort to determine the place in the brain that is causing the problems. Najib Murr, M.D., assistant professor, neurological sciences, will be performing and analyzing the EEG arm of the study. They will test a smart phone app that can be used to diagnose the disease by measuring tremors in the legs. They will receive specialized video analysis developed at Massachusetts Institute of Technology. They will receive psychiatric assessment by a UNMC psychiatrist, Mark Fleisher, M.D., that will attempt to measure their level of suffering. OT is characterized by high frequency tremors of the legs when in a standing position and an immediate sense of instability. Because of the speed of the contractions, OT is often not recognized as a tremor when compared to essential tremor or Parkinson’s disease. 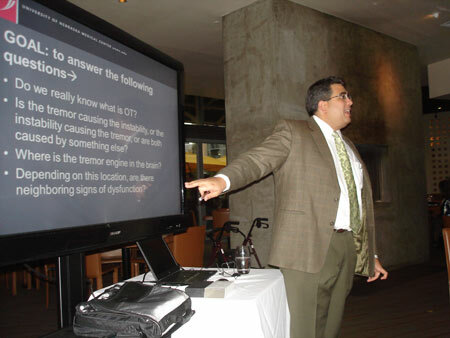 Dr. Torres-Russotto said OT is greatly underdiagnosed and often misdiagnosed as other neurological problems such as Parkinson’s, essential tremor or psychogenic problems. OT is a repeating cycle that happens all through the day, he said. It is life-changing and unrelenting. There’s usually a 10-15 year lag between onset of symptoms and diagnosis. Onset typically occurs around age 40. It won’t kill you, but it typically gets worse over time. Diagnosis is confirmed through electromyography, or EMG, a test that measures the electrical activity of muscles. By touching something, the feeling of falling improves. The UNMC study will be blinded, Dr. Torres-Russotto said, as half the participants will have OT and the other half will have no balance issues. He hopes the study will lead to further research and treatment options. For more information on OT, go to http://www.orthostatictremor.org/. Pat Ryan (left), a patient with primary orthostatic tremor (OT), goes through a sitting-standing maneuver under the direction of Lori Schmaderer, a physical therapist with The Nebraska Medical Center. Ryan, who is from Hixson, Tenn., is one of more than 50 OT patients who came to Omaha to participate in the largest study ever done with OT patients. It's a debilitating disorder that causes people to feel like they are going to fall down when they are standing. With the variety of evaluations, history, specialized testing, the EEG, and EMG from the wonderful staff at the UNMC almost completed. I would guess that for many of the researchers their work will not be finished for quite awhile and it will be some time before any results could be uncovered. I'm not sure how Peggy accomplished everything that she did, and all of the other volunteers, who lead meetings, made name tags and filled the week with events. I took a peak at Peggy's notebook that was critical to organize this event….. that notebook may be worthy of it's own research event. The staff at the hotel that was always available. Simple things like chairs in the hallways and next to the elevators! Companions too.. I spoke with one individual who mentioned that when he was asked if they could go, his answer was "of course"…. there were many very touching moments. There was a large range of people attending, as there are with OT, assistive devices of all types, canes, cane chairs, folder chairs, and people that flew with their own wheelchairs. There were people that drove from as far away as Canada, but for everyone that attended there were many more that would have liked to have been there too. One of the obvious casualties of OT is mobility, but I can honestly say that even if you were not attending, you were in everyones thoughts. As we patiently wait for any outcome of the research, your conversations and reports will be very important. But many people have probably not reached home yet, take time to exhale, to enjoy the lingering smiles from new friends and reconnecting with old ones too. Nancy sent along a couple photos from the meeting (see below). 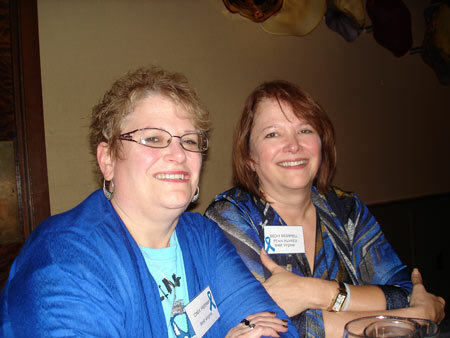 Nancy and Jane (seen in the 3rd photo wearing prism glasses) presented their experience with Prism glasses. Neither of their doctors promised that they would help with OT and yet the positive benefits that they experienced made for a very interesting discussion. One thing is clear, there is so much more to know about OT and research is needed in many areas. Thanks to Jane and Nancy for the presentation and being very generous to tell everyone about your experience. Also included is a photo of Rita's discussion on her experience with DBS and a everyone had an opportunity to ask questions as well. It was so nice that people offered up their time and experiences to share information. Tim, the amazing photographer and Chris's husband took many that will eventually be posted. If you have any photos that you would like to post, please send them to me at the following link, you can drag photos to this page, or select what you would like to send. Make sure that you click on "Start Uploading Files" when you are done. And, if you have any thoughts on the meeting please post them here by clicking on "Reply" below (the reply button appears after you have logged in). It is great having free wi fi on the aircraft. 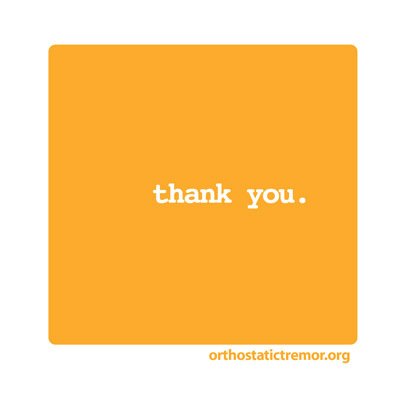 The past few days have been a real privilege, being part of the largest study to date into Orthostatic Tremor. Dr Torres-Russoto and his team at the University of Nebraska Medical Research Centre have studied 40 OT patients from USA, Canada, Australia (me!) and an Englishman resident in Spain - the largest group of OT patients studied to date. 10 accompanying spouses served as a control group for part of the research. 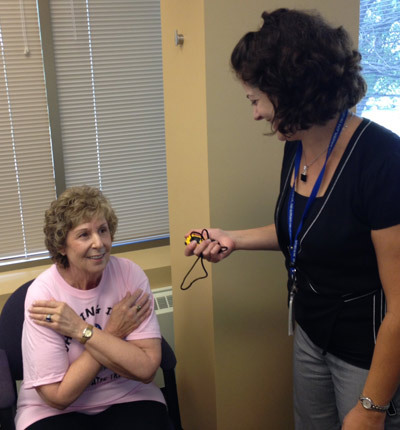 The research took place over five days, when we were each individually interviewed, had our tremors measured through a small electronic, portable EMG reader (the Liftpulse app). We had our medical history reviewed, were given EEG examinations, both lying down and standing, put through a series of balance and coordination evaluations and had a psychological assessment. The latter I am still to have - they will phone me next week. Dr Rusotto came to dinner with all of us on Wednesday and Thursday evenings, and gave a full presentation on Thursday evening. This covered the current state of knowledge on OT, the important areas of current ignorance and the purpose of his study. Dr Bhatti, a member of the research team, has read all the available scientific literature, and reviewed the information on particular patients included in the existing research, and Dr Torres ran through the main elements of his findings. He then ran through the objectives of this current research project. The first is to come up with a standard set of criteria for judging whether someone has OT. This could then be widely circulated throughout the global medical community, so that when someone like us sees their medical practitioner or a neurologist, they will know what to look for and then be able to find out what remedies might be available for us. Most of us had gone many years without a diagnosis and been subject to hit and miss 'treatments' due to general medical unfamiliarity with our relatively rare condition. It is hypothesised that our condition is not actually so rare - it is just seldom properly diagnosed. Another hope is that the analysis of our brain activity might lead to identification of where in the brain the seat of our disorder lies. If this is known, possible treatments or interventions could follow. Another area of the research is the link between balance, vision and posture issues and OT. 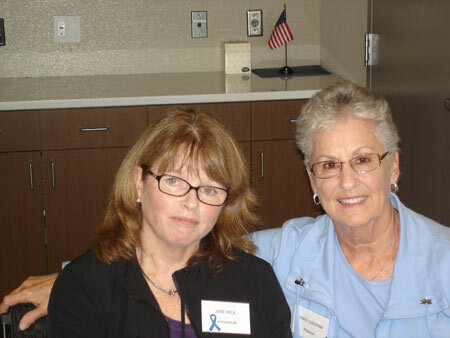 In a separate session, outside the research program, two OT patients shared their experience when their OT was reduced after use of prism lenses in their glasses corrected vision disorders. Another focus of the research is the psychological impact of OT. During the study, 3 participants were confirmed, for the first time, that they had OT. These had previously self-diagnosed, drawing on the material in the OT website. The video and full version of Dr Rusotto's presentation will be available on the OT website, due to the tremendous efforts of Jeff. He and his wife wife were present throughout the week, helping and supporting everyone, including his Mother, the redoubtable Gloria. Personal informal networking and exchange of stories was a most important part of the week. Some knew each other from the previous Omaha research meeting, two years ago. Others, like me, were new, and were made very welcome. 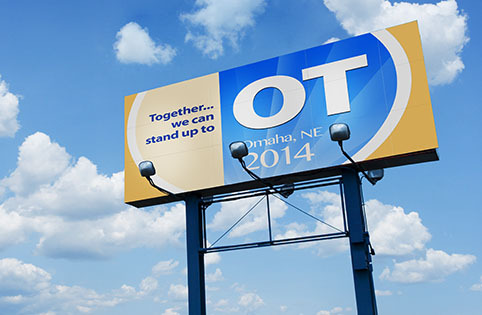 This OT community is a positive and cheerful group! Peggy Whitta from Canada did a great job of pulling all the arrangements together, outside of the actual medical research. Her lovely husband Garry was with us too - another helpful chap. I couldn't help thinking about the Monty Python 'I'm a lumberjack' song! I have come away knowing more about the condition, and very pleased indeed at being part of this research study. Dr Torres-Rusotto told us that the whole research team have given their time as volunteers. The funding for the EEGs was met by the university. We are all very grateful to them, and look forward to the series of reports in scientific publications which will emerge, in due process, and will, we hope, prove beneficial to the OT community and their families, and the medical practitioners who seek to help us. Sue it was so nice to see you again at the meeting in Omaha and thanks so much for your comprehensive minutes covering the greatness of our meeting and research. We all enjoyed having you part of our gatherings and your thoughtful input . I believe we all came away from the Omaha meeting and research events with a feeling of new recognition and medical help in our future for which we are so grateful. Also as you know I have said many times on the website , meeting with other OT people is the ” greatest medicine we have ”, well this time we were given a “big dose”!!!! 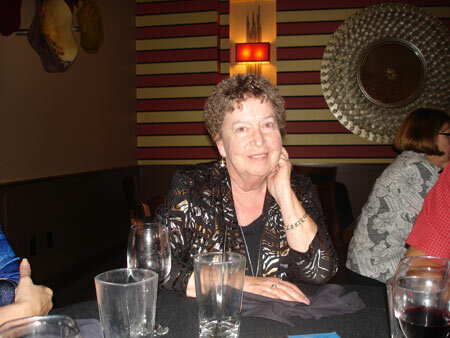 During our days in Omaha, we watched our OT friends with smiling faces as they sat and talked with other OT friends comparing notes as they became part of a group rather than living in a state of loneliness. What an amazing week – I will just give highlights from my perspective. I am going to post this on the forum also and would encourage everyone to post their comments on the forum rather than emailing me back – this way we can all see the comments and add ours. I just found out when I arrived in Omaha, Monday night that Dr. Torres and ALL HIS STAFF VOLUNTEERED THEIR TIME – once again to do this study. That is close to 30 medical professionals. This is truly amazing! They are all very busy people and yet they are doing this. I couldn’t help but wonder if this would ever happen at another hospital. Everyone that travelled to Omaha did so at their own expense and that was greatly appreciated by them – they need us and we need them. If anyone has the financial means to take it one step further and support the Foundation that he has founded to help only OT people it would certainly send them another message that we are committed to helping. I think everyone found their appointments at the hospital very interesting. The staff could not have been more obliging. Dr. Torres – isn’t he something!! I told everyone they would love this guy – he is really a remarkable individual – so dedicated to helping us and so approachable, kind and caring! One of the professional staff at the hospital told me “he is a real star at the hospital” – I believe it. A big thank you to everyone who contributed and organized the monies given to the Foundation as a thank you to me - $820. was the total. There is nothing I would have wanted better than this! I also wanted to acknowledge all the emails I got when I was organizing this, thanking me. I know you understand that I did not have time to answer back, but I did appreciate it – I did answer all the questions submitted – usually very short answers was all I could handle. I heard many positive comments on the sessions of Prism glasses (I am just so happy for those two individuals who spoke on this and their success with OT symptoms using them). Everyone should be checking into this in my opinion – who knows who else might have success. You can read more about this on the forum as I know Jane Vece said she would be putting the “presentation” she did on the forum. The DBS presentation was also so interesting – good to be informed and when else would you get an opportunity to hear someone’s story on this and ask questions. I among others loved the chair yoga – thank you Beth for suggesting this idea and making arrangements with the instructor. Of course, the very best thing is just meeting other OT people, making friends with someone who completely understands what we are going through. I and others have said many times that when you come to a meeting like this – it is kind of like “instant friendship”. I have met some amazing friends myself and I am sure others feel the same. Another thing that happened at this gathering was that I had a number of people contact me about offering to help in the future – about raising awareness, and about offering their services to us. More on that to come. Ps. In the next couple of days I will give you some insight into a couple of things we will do differently at the next Omaha meeting – I know we will be returning there again. 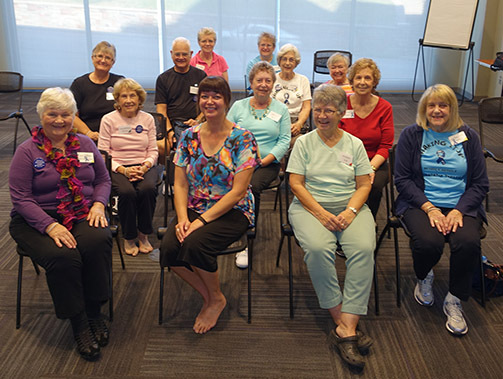 Stephanie Watson was the perfect instructor for the Orthostatic Tremor meeting chair yoga. And the session was an ideal break from the travel, the medical testing and the new environment at the hotel. She tailored the session to focus on breathing, relaxation, and gentle stretching, all from a seated position. Many thanks Stephanie!